Today was the day the two year training program for the IceWing's Kingdom's volunteering soldiers would be trained to be valued units in the military under the supervision of Councilman Lao, Councilman Apolis, and Councilwoman Sindragosa. Apolis cracked a smug grin upon his frosty lips, taking seat on his adorned seat upon the desk which would unite the council. Down below them was an empty room beckoning the arrival of his future personnel. Earlier this morn, Apolis had sent out his messengers to greet and beckon those who were interested in serving in the military, and would be informed of the program and begin the training immediately. Apolis entwined his talons with one another, locking them in place as he eagerly awaited for the room to fill. As the hours passed, the room became filled with interested future-units. Almost-soundless murmuring could be heard in between chit-chat and inquiry. He smiled. "At ease, my soldiers! Today, you are no longer bystanders of this unprotected kingdom! But rather, it's future guardians. Those who are willing will be put into a two year program which will train you to become soldiers of prime quality. In between designated moons, you will be examined on the skills we have honed and if you pass, your options will expand as to what you will like to serve as under Councilman Lao and I. Councilwoman Sindragosa will also help supervise the examinations, and be present for any medical attention necessary." He flared his wings dominantly. "The first exam will take place two months from now. You will be face with harsh and unforgiving circumstances, only be given medical treatment when needed, you will learn to survive on the battlefield. All who are willing to suffer to protect and to serve, please step up now! And will shall commence the training program asap!" Nihlus had been training not far from the kingdom when he was approached by two royal messengers. They bowed politely as Nihlus stopped what he had been doing and strode over. "Greetings, Nihlus. We have come to retrieve willing Icewings to become a soldier-in-training within the Icewing militia. That said, are you brave enough to apply?" One of them addressed formerly, reading off of a scroll held open in their talons. Nihlus raised a prominent brow and frowned "How exactly would I benefit from this?" The two Icewing messengers exchanged nervous glances before checking the scroll once again. They looked up after a few moments of whispering to each other. "Eh.. Well.. There aren't any.." Nihlus grunted disapprovingly. "No payment? Nevermind. I'm applying anyway. I have nothing better to do..." The faces of the messengers lit up and they both nodded vigorously. "Fantastic! King Apolis is waiting within the castle. You should make way at once!" The messengers turned around and took to the sky, speedily flying off to the next Icewing they spotted. Nihlus sighed and shook his head. What am I doing? Nihlus reached the great hall where Apolis awaited. He appeared to be the only one there at the time. However, as soon as he took a seat, Icewings began crowding into the hall one by one. Wolf had just gotten back from a hunt, carrying two large caribou when two messengers stopped her. As they talked about this new military program the king had implemented Wolf couldn't help but give a little laugh. Even if she didn't share her thoughts with the messengers, she couldn't help wonder how many IceWing would actually attend this meeting. Because the curiousity got the best of her, she decided to come and see who'd actually be there. As the messengers flew off to their next victim Wolf headed to put her deer in the storage then set off for the meeting. After seeing the slow trickle of others come in Wolf decided to sit down. Not to look like the stranger in the corner she decided to sit in the middle of it all. Unknown to her she sat by Nihlus, the IceWing Semi-god. Wolf glanced around at all of the other IceWings, then directed her gaze to the front. There was Lao, Apolis, and another dragon of whom she did not recognize. Giving an amused snort she leaned to Nihlus and whispered, "This shall be interesting. Why did you come here?" Kyuurei was lazing around outside the Icewing kingdom when the two messages approached him, they talked about a military training program or so what Kyuurei has heard. He thought it sounded interesting for him and he will go and join. Kyuurei recently joined Icewings because he wanted to know what is it like to be in a dragon tribe, before then he used to live with the wolves. But if his dream wasn't enough reason for him to join the military, he gave up serving the wolves pack as a hunter and guard to go for a better life as being part of the pack wasn't enough adventure for him. He thought trying this military program out was a good idea. When Kyuurei arrived to the room where the meeting or gathering is held, the other Icewings were there before him, perhaps Kyuurei was late again. He had a hard time understanding what is happening around this place, he kept bumping into other Icewings and didn't know where to sit for quite a while. Also, Kyuurei may have missed some of what Apolis had said. But he did not show his embarrassment in front of the crowding Icewings. Apolis smiled as the seats began to fill, eyeing down his applicants with a appetite for potential. But a wide grin dressed his maw as he took sight of three star dragons. - Nihlus, IceWing Semi God, Wolf, a prized tracker, and Kyuurei, a foreigner who he had gracefully accepted under his wings. Apolis found that the third dragon in line, Kyuurei, would have difficulty seating himself. He would have to invite him to seek out Sindragosa in the Sciences Dpt. for physical aiding. His talons retreated from one another's grasp and were placed on the thick, icy desk in front of the councilmen, tapping it patiently. "Allow me to inform you further. Soon after the training program has commenced it's final stages, you will be faced with trials so aggressive, famine so ravenous, and climate so callous that it would make an IceWing shiver. I shall go in depth. In the first three months of the training program, applicants will be honing their current strengths and abilities to complete certain tasks until completed flawlessly. These trials shall consist of the following: Retrieval, interior and exterior endurance, and ability enhancement. These will go in random order and all of them will be done constantly throughout the next few months. The training program will begin momentarily, please exit the building and relocate yourself at the nearby hunting grounds. I'm a few of you here are trackers, so I assume you know where it is and I reckon you guide your new teammates to that designated area." He smiled and nodded, leaping from his seat, to the ground, and to the exit. Soon taking flight and headed for said hunting grounds. And within moments, he and his messengers had arrived to the grounds. "Honestly, I'm quite excited for this program. No other monarchs prior to my reign has commenced such plans. I am shivering in my own scales to see the outcome." Sindra simply sat there, at the hunting grounds far before anyone else arrived. She could tell this was the place where the future soldiers of the empire would gather along with their king. This didn't take some sort of future sight magic, she heard that that kind of magic exists but she would never want to have it, simply some reasonable conclusion as this was the perfect place to start the training on with its size and the position outside the empire. As she was sitting there, slightly off-view for most who approached the hunting grounds, she was uncloaked, showing off her skeletal being, while writing on a scroll all she knew about necromancy, after all she wanted to contribute to the knowledge in the royal library by telling others of her own magic. That didn't mean they would be able to learn her magic just from the scrolls, no. To learn necromancy, it actually takes a teacher in order to further understand how the magic actually works. As she finished the first scroll, heaven knows how many she would actually have to write, sealing it and giving it the title "The Dance between Life and Death, Act I." she saw a bunch of very familiar dragons land in the grounds, namely Apolis and his always-present lapdogs. You? Shivering? I would actually like to see that for once, my dear Apolis. Anyway, I am here as you asked for. Akull was busy in his den with papers, when he heard dragons coming. He put all the papers away and looked toward where they wuld be. The two messengers appeared and stared at him as he stared at them. "What is it?" One messenger jumped and the other said, "We are seeking willing participants." Akull nodded his head and said, "Participants for what? THe messenger sighed, "Participants for the two year soldier program.." "So you want me?Okay. Where do I go?" Akull then followed them to *insert where hes supposed to go* Akull took a seat near the back and listened to everyone. When the rest flew, Akull followed. He also landed behind everyone. Apolis shook the snow off of his pure-white mane and cleared his throat of those unwanted fluids, gazing at his prized friend and peer. "Yes. I want you to help me examine the volunteers' performance and skills. I reckon there is a volunteer who may be blind, I would enjoy it dearly if you would take a look at him and see if you could do anything. If not, then so be it." He shrugged with a sly grin, glancing down at her documentations. "Ah, you are always writing something. Future necromancers will thank you dearly for your insight and knowledge. You are indeed, my prized friend and peer." He praised her sincerely, chuckling softly as the applicants raced to the hunting grounds. Some were already out of breath. Apolis observed them attentively. Friend and peer? She couldn't hold a light chuckle back. For her, he wasn't much more than an interesting test subject. While she had not been living with her godly parent and has been living the life among mortals for most of the time, she still saw them as inferior to her. As such, whether or not Apolis was actually serious about calling her a friend wasn't important, he wasn't really a friend to her. She was more like a spectre hovering over him, watching and assisting him out of curiosity than out of helpful intent. Nonetheless, she was here to help him so he had all right to think what he wanted. As such, she simply smiled at him...at least, she would have if she wasn't such a skull-head. Well, of course, I am here to help you in what you're planning to do. On top of that, I will look into that one you're talking about specifically and see whether or not I can restore the eyesight to him or not. And I thank you for praising me in such high regard, my sweet Apolis. She came up to him and gently nuzzled his neck shortly as she saw the participants arrive at the hunting grounds, some of them exhausted already. Sitting down next to Apolis, she simply decided to see this out and maybe find the one he requested her help for. Soon, more and more found their way to this place, ready to start their long training under Apolis and the others she only met a very few times as they wasn't really any reason to spend time with them. The king was different, he was her object, or rather subject, of interest so she was rather bound to stay close to him and listen in on all his schemes and plans, at least those he revealed to her. After listening to the meeting about trials, Kyuurei noticed that everyone was leaving the room by flight. Flying wasn't his strong point but he is getting better at it. He took off in no time and followed the other Icewings. When he have reached to the hunting grounds, he didn't know where to land. He slowly flew closer to the ground, but he accidentally bumped into an Icewing and lost balance and plummeted onto the soft snow. After taking a breath, he got up, looking around uncomfortably. He hoped that no one saw him fall. Kyuurei shook the snow off his scales. 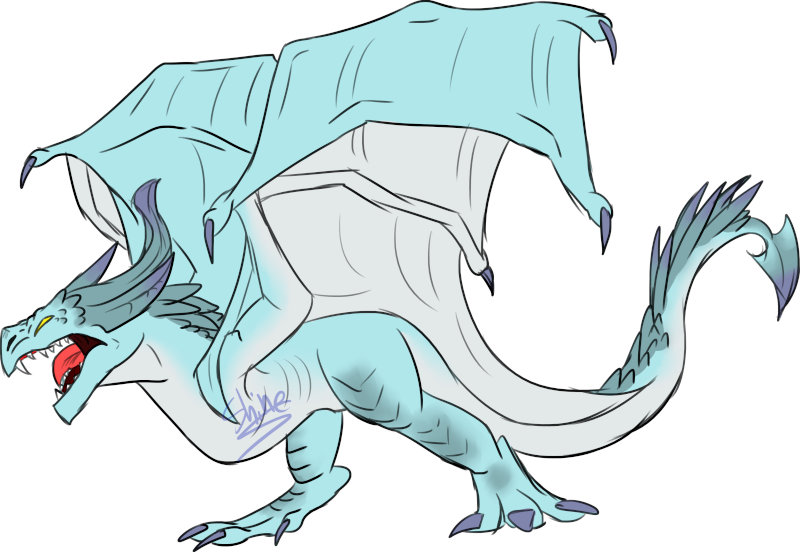 Apolis chuckled confidentially as he was addressed by Sindragosa, soon nuzzled and sat next to. This made him more chipper and pleased as he saw his soldiers line up, several were exhausted, and many were competing. Lucky them, this upcoming trial would be somewhat competitive. But as he took sight of the disabled dragon, Kyuurei, he recalled, he pointed his talon to the brute. "That is him, precious. I would like it if you'd examine his eyes..." He mumbled before patiently awaiting everyone's arrival. Akull stood confidently. He watched everyone else. Studying their weak and strong points. He saw one stumble when landing and made notes to talk to that one. He glanced around again. He returned his gaze to his king, waiting for orders. He stood gracefully. Late, as usual. Gemna had flown in at a bad timing on his part, because not only was he late, but he missed a speech! He usually gets caught on his studies on arctic/winter animals, reading scrolls, and doing calculations! Sometimes he does not arrive when needed because he stays up every sun and moon just to get something in his studies right. He was a geek, in general, a strong geek at that. He was intelligent and figured out problems with no problem of his own, like a jigsaw puzzle of thousands of pieces, he could swiftly get it done. Gemna landed, not uttering a word since thing seemed to have already started, or so he thought. He was waiting for the questioning form the king at any given moment. Gemna knew not to ramble on, but if someone asked why he was late, he might just do that so they could understand all of the things he had gone through these past few seasons. Apolis cracked a smile at the notice that everyone had arrived. He was itching to commence the program so hence, he spoke sooner rather than later, addressing everyone as his assessors began to arrive as well. Vince, Tecumseh, and and Savar, lining up around Apolis with smiles on their faces. Sindragosa was also going to be there to enhance their performance. As he scanned the area, there was no sign of Lao. He sighed and fixed his gaze back to his units, and would continue the assessments before he arrived. He would already have a good grasp of what was to happen when he would arrive, anyway. Apolis raised a talon to silence everyone, "Now, don't be alarmed, everyone. Our assessors, Vince, Savar, and Tecumseh will be coming around and asking questions about your strengths and weaknesses. After we have collected all said information from you, it will be taken into consideration as we advance to our pre-assessments, which will consist of the following: Endurance, physical combat, defense and durability. Please answer honestly." He smiled as the assessors proceeded down the line to ask everyone about theirselves. 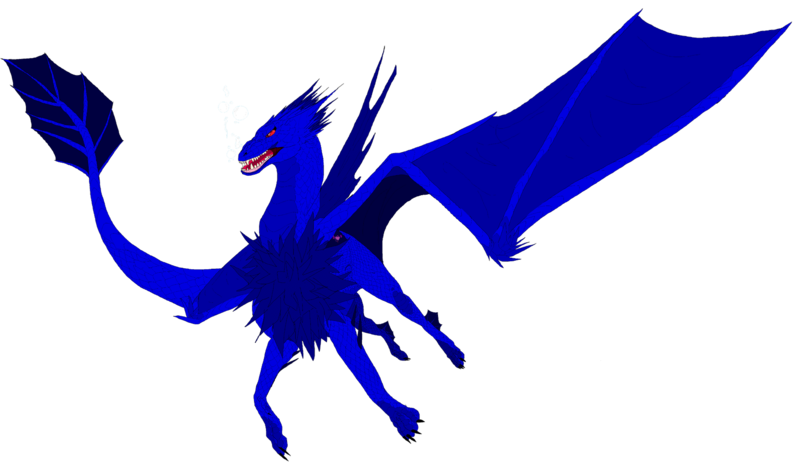 Akull watched as a few dragons joined Apolis and Apolis explained waht was going to happen. Akull stood and waited until one came over to him. He nodded at him and said, "I dont have many strengths but I can work with the few I have. I have a little shriek that can stun, and im strong. Strong enough to do straining stuff. I am also extremely smart, if i say so myself, and can cook up a trap. I also have a bit of control over ice. With weaknesses...... hmm.. I have a bone defect, which disables me from running very far. It is also mostly in pain. I am also very paranoid.I am extremely afraid of fire. He stared directly at the assessor throughout. He kept his head high and whispered one more thing. "I also have a slight fear of sweaters." Savar walked over to Akull with an ink-stained talon and a small scroll, a rather questionable expression withheld on his face. As he was given the information, he recited the following as he finished. Abl./Str./Weak. : Shriek can render a target stunned, above average intellect, capable of controlling ice/snow, tactician. Bone defect, paranoid and afraid of fire. Possibly... sweaters. "Psssahaha... sweaters." He chuckled, "Alright, Akull. I think we have a good idea who you will be trained under." He rolled the scroll back up and frowned, moving down the line. Kyuurei was wondering around, sniffing other dragons, that way he can figure who is which he will meet next time. After he listened to the speech, a dragon came to him, asking information on Kyuurei's strengths, abilities and weakness. Kyuurei isn't completely aware of his abilities, so he explained one ability he knows. "I don't know what are my strengths and weakness exactly but, I can do this!" He turned his head to the left and careless aimed a beam of ice which seemed to glow, making a block of ice, he didn't know if there was something where he shot the ice beam at. "What do you think? Is that enough information?" he looked back to the assessor, grinning. Wolf had followed all the other dragons here. She wasn't in much of a rush and rather landed with a gentle grace. She chuckled at the others who were already out of breath. If she had actually tried, she'd barely be tired at all. She listened to Apolis with a smile. Endurance? No doubt she'd be able to pass that with flying colors. She could lope all day with barely breaking a sweat. Physical combat she was okay with, considering she was stronger than most trackers. Defence and durability. She had some close calls with some caribou before, but those were deer, not full on dragons. Wolf waited patiently with her head up and proud before a dragon came over to her. "Hello, my name is Wolf, IceWing Tracker.She started, "Being a tracker I have great endurance, able to lope all day and still have energy to spare. I am stronger than most trackers meaning I'm able to fight better than they can. I can also track thing, may it be from prey to dragons. I can make figures out of ice, which could be used for a distraction, or to make our army look bigger. Also, I can shoot bolts of ice from my mouth, may they be big or small. Gemna awaited for his own turn, letting the others speak first before speaking himself, "My name is Gemna, and I am amongst those of the Guardians. I can easily withsatnd stronger attacks formed or built up of ice, I can freeze various bodies of water, large, small, so on, as long as the area is... not too hot. While I do have frost spikes on my tail (for secondary attacks) I can breath frost itself, mixing sharp shards and pieces of ice to make the breath more effective, think of it as fire, just it freezes instead of burning, I can charge it up to turn it into a powerful force of beam, ball, or even a wave. I prefer to attack from afar from taking any myself, but if I need to, I will fight on ground... however... I am quite, what the word, OCD about plains of snow. I feel they need to be completely flat and untouched," He was explaining just about everything to the king, not missing anything he though, Gemna was quick to speak as well, just in case any other wanted their turn as well. "I cannot withstand powerful flames attacks, or fire for that mater or scorching hot water for that will crack my icy armors and will destroy my scales. Just like regular ice. If I go into hotter conditions such as volcanoes, jungles, or forests that are not in the cool falls or the cold winters, I will get sick, in return this disables me to fight properly. However, I can withstand warmer areas, its just that it makes me feel uneasy, it makes me weaker." He spoke of his weaknesses, which, since he is a pure ice dragon this would make complete sense on his part. German had always been careful of going into amor areas, since he was an easy target for others, he could not attempt to make any sooner trips to the outside of the cold wastes. "One more thing. There is an ability that allows me greater manipulation of ice and snow. It's called a FrostRune, and believe or not it is embedded within my eye, while it does not hurt at all and does not affect my vision, it drains a good amount of energy from myself, however, with the duration I am used to, I can use it twice, but it does not last for very long." He explained his power, the FrostRune. This was his trump card in most battles, even against fire-base creatures, since he can control any ice or snow he figured, why not bury then in the waters? Not only would they suffer from the cold, but they could not breath nor use fire attacks. Gemna was happy with all he had, if he could gain more then sure, he is up for that, but for the most part, he is confirmed himself to be useful, and useless in some situations.